It comes as no great surprise to those who know me that I'm a Dr Who fan. My favorite doctor is the tenth Doctor - David Tennant. I could write an essay on why he's the coolest, sexiest, most interesting Doctor with the best story arcs but this is a knitting blog after all. I'll just post a photo of the most awesome Doctor for you to contemplate (There is a point to this, I promise you). 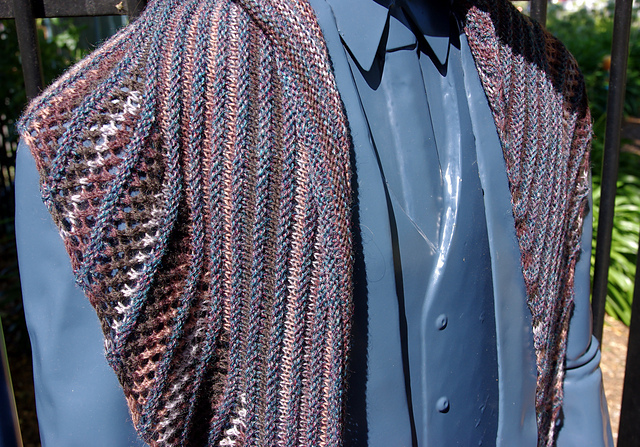 After last year and all the shawl stuff I still hadn't quite got it all out of the system. 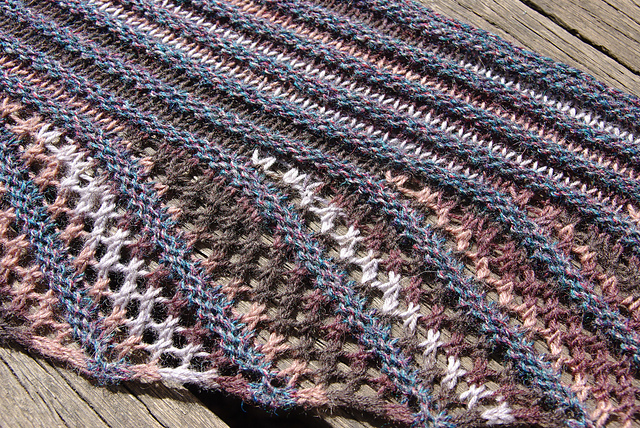 I may have wanted to make yet another lace shawl and after much deliberation and hours of time spent squirreling through the Ravelry pattern database, I decided that Nymphadelia was the next lace shawl for the needles. 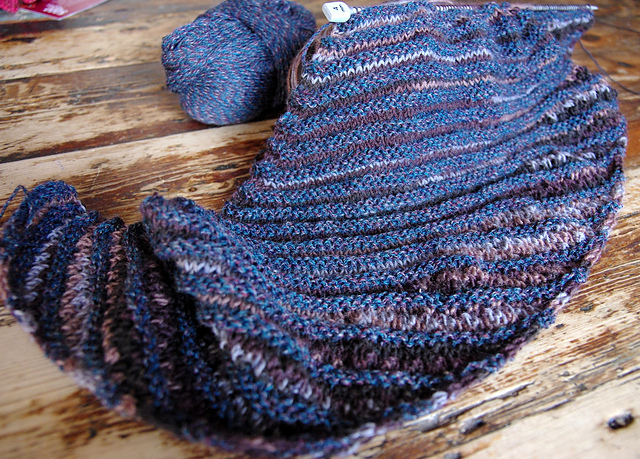 Blue tweed and brown variegated sock yarn together should be cool. (This has the added benefit of using up the stash as is my goal for 2015). I was right. It is cool! I was a little dubious about these two yarns together in the ball - variegated yarns often knit up so much differently to how they present as a ball and so I was hopeful it would work like I pictured it in my head. Why this colour combination? I love blue and brown together. It quite frequently features in my wardrobe. This particular blue and brown colour combination is my tribute to the 10th Doctor. These colours evoke his costume: blue and brown pinstripe suits, a long brown overcoat and converse sneakers (See photo above). I may have temporarily yarn bombed another statue. It was just the right shade of blue. How could I resist? And that is part of the inspiration for the name too. 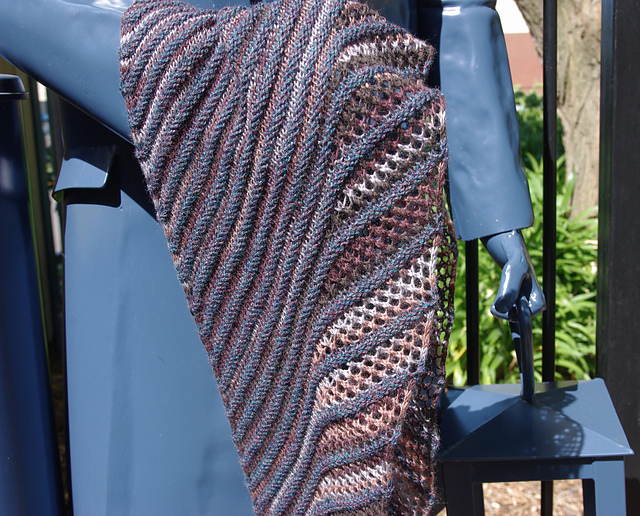 The shawl pattern (a free one from Knitty magazine) is called Nymphalidea (the Latin name for one of the largest butterfly families). The colours are 10th doctor inspired. Hence Butterfly Kisses for The Doctor. I cast on as Day 1 project for Feburary COM over in Village Hopelessly Overcommitted (VHOC). 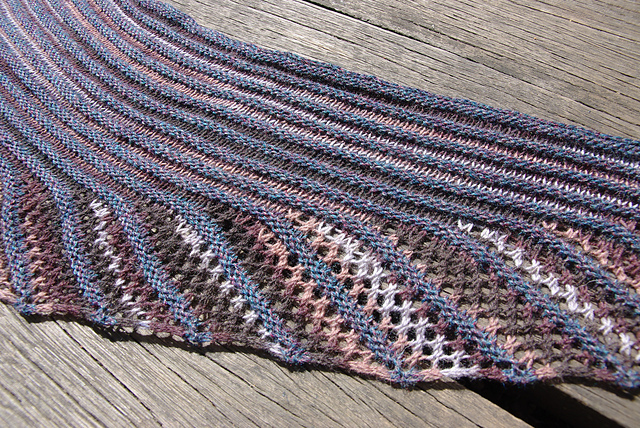 Must say I love the simplicity of the lace and purl ridges and the effect of the variegated yarn. Easy to remember pattern and it’s flying along. I managed 18 repeats of the Wedge D and welt combination in the first day. The next day I got to 21 repeats and then 24 repeats on Day 3. Day 4 was a day of long train journeys. Prime knitting time. So I finished all 27 repeats. (And I ended up with the correct stitch count as given in pattern! Bonus). 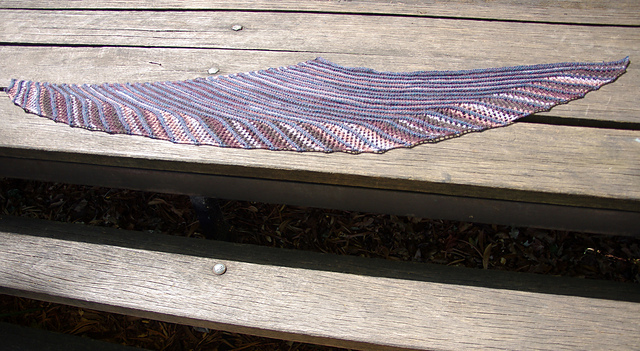 The shawl was now in need of aggressive blocking to show off in its full glory! Lace is so messy just off the needles before blocking works its magic.